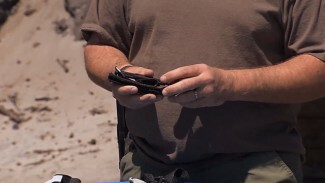 Competitive shooter Rob Leatham leads off the discussion of aiming a handgun vs sighting. If the shooter is very close, it’s an easy shot. He’s not going to aim. He’s going to point the gun and pull the trigger as fast as possible, check where the hits are, and move on. 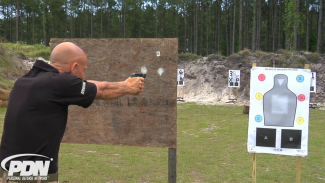 Defensive shooting instructor Rob Pincus agrees with this and that it applies to all realms of shooting, from handgun training to competition to self-defense. What if the target is farther out? They use the example of a target eight yards out. Rob L draws the gun. When the gun stops moving, he sees everything he needs to and he takes the shot. Looking at a smaller target that is even farther away, Rob L visually verifies his sight alignment before taking the difficult shot. Rob P then takes the same shots. At the closer target, he doesn’t look at the gun. He drives the gun out using kinesthetic alignment and presses the trigger. 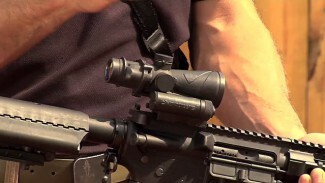 Looking at the smaller target, Rob P does not focus on the front sight, which is a large bright fiber-optic sight, but he is aware that it is there. If Rob P has to hit a smaller area on the small target, he focuses on the front sight, and consciously looks at the front sight and gets sight alignment and sight picture because the target area is so small. How Do They Teach These Concepts? If taking that difficult shot, Rob L stresses that the shooter needs to see a sight picture: the front and the rear and the back. Rob L never focuses strictly on seeing the front sight clearly. Make sure to watch the beginning of this discussion in Part 1: Does Barrel Length Matter? Old-school thinking held that if a tourniquet were used on an extremity wound, the injured person would lose that limb. That has been shown to be incorrect, and tourniquets are now in the first-aid kits of medics on battlefields and streets worldwide. Rob Pincus reviews the key components to a efficient reload from bolt-lock with an AR type defensive rifle. Keeping the rifle in the ready position means that it will be easier to get the gun back into a shooting position, if necessary, when your reload is complete. 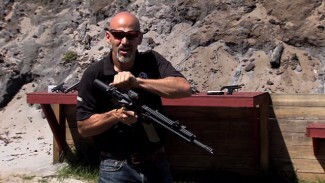 Rob Pincus demonstrates the benefits of the BROWE Combat Optic, the advanced sight that is perfect for use in live combat, on security patrol, or in certain cases, self-defense in the home.